Do you know how turkey came by its name? A New World bird with a Middle-Eastern moniker, I found it a little odd. Well, I was itching with curiosity and stumbled upon a very entertaining blogpost in Greek by Nikos Sarantakos. A fellow linguist who has followed the bird around traces a very interesting linguistic footprint. A bird indeed from elsewhere, as no one felt like laying claim to its origin. The French called it dinde, poulet d’inde,derived from the Indies (think of the West Indies). For the Portuguese it was known as peru, as it arrived from Peru and in Croatian puran, from the Italian Peruano (Peruvian). In a Bulgarian dialect it’s called ‘misirka’, from the Turkish word Misir meaning Egyptian. In turn, in Egypt they call it dik–rumi. Dik for rooster and rumi for the byzantine part of the Roman Empire, predominately Greek, that leads to the very free translation: Greek bird. As for the Greeks, we call turkey: γαλοπούλα, galopoula which creates the hilarious but false wordplay of French bird. Of course galopoula has nothing to do with France, we got it from the Portuguese (and Spanish and Italian) where galo is cockerel. 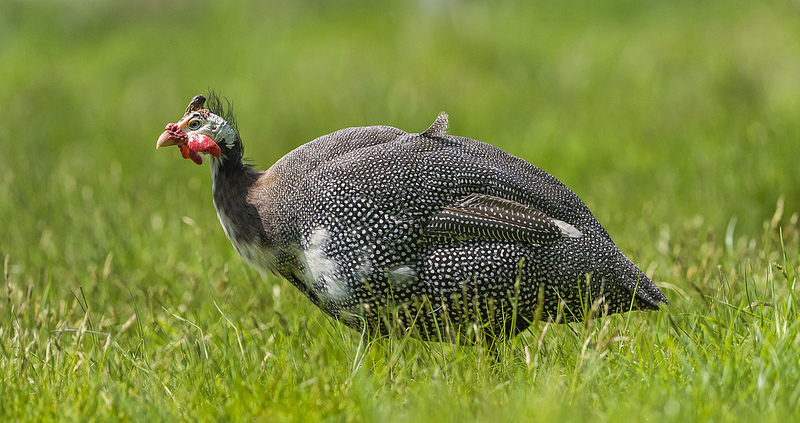 Stretching a little before old and new world met, Medieval Europe did know something very similar to turkey: the guinea fowl. Back then it was called turkey hen as the native African bird was traded through Turkey. People eventually realised the difference and renamed them. Yet the new bird got along well with the old bird name, which is still around, even if a little less popular than its famous Christmas cousin. 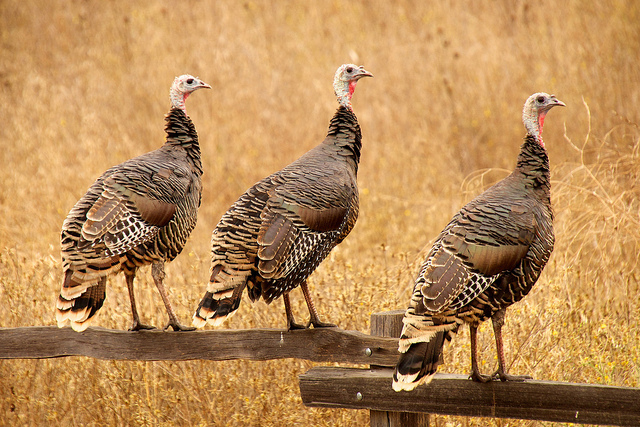 So turkey, meleagris gallopavo, got its name by mistake due to its similarity to the fellow fowl. Guinea fowl is a very old bird indeed, Aristotle describes it as meleagris in the History of Animals and I am pretty certain we stuffed it back then as we still do for game birds today. Now the Christmas tradition for stuffed turkey is a relatively new one, it can be traced to the beginning of the 20th century and has over the years gained more and more popularity in the urban centers. 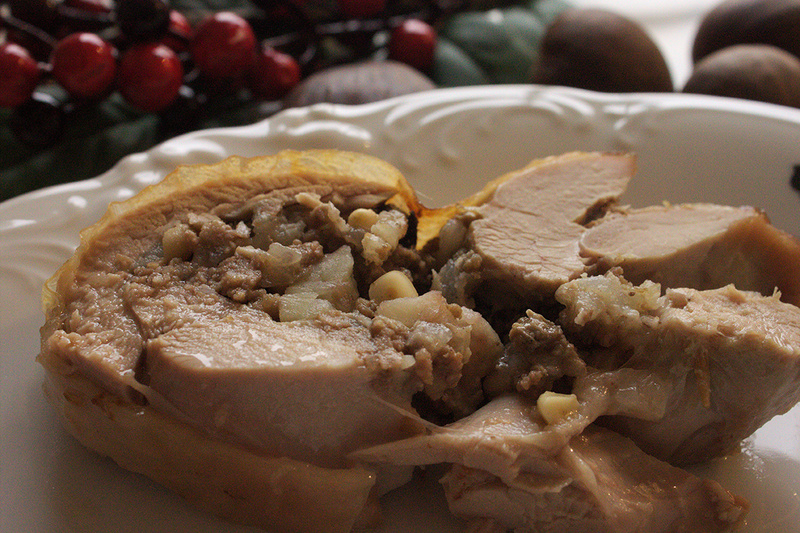 If you are used to cranberry sauce, bacon and sausage meat stuffing you are in for a surprise. The traditional Greek recipe uses very different and seasonal ingredients: chestnut, pine nuts, raisins, some mince meat and lovely all spice berries and cinnamon. Are you ready? Ok, a warning not to get your hopes up, I haven’t made a whole Christmas turkey this soon before the big day, instead I only stuffed the legs. We do like turkey but I think we like the stuffing more. So to avoid leftovers I asked my butcher to debone and open up two legs. 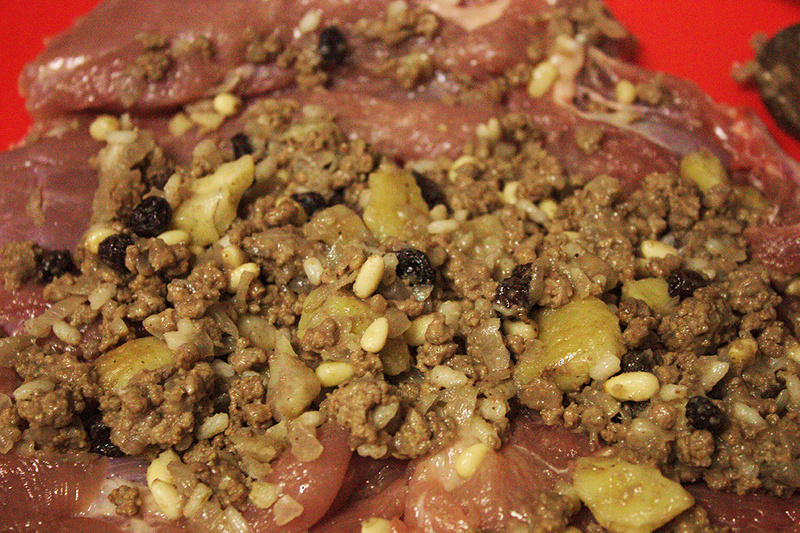 I simply spread the leg flat and added as much stuffing as the natural fold of the meat could take. It’s almost like a rolled joint without the nightmare of a mesh. Once stuffed, I secured the edges with toothpicks, brushed it with olive oil and a sprinkle of mustard powder and salt. I wrapped my turkey legs in baking parchment individually without tying them though so that I could check the progress. I bought my chestnuts fresh this year!! If you find them fresh, do go for them, your place will smell lovely! It’s easy to prepare too: make a little cross shaped cut in the bottom and pop them in a pan of boiling water with a tiny bit of salt. Your chestnuts will be ready in 6-7 minutes. And now the fun begins! Taking out of their hard shells is a little tedious, but you will certainly be rewarded. Believe it or not this is a man’s thing to do in the Greek kitchen. I remember grandpa doing it since I was a kid. Whilst gran was pottering about the kitchen, he was humming a tune, patiently peeling and popping one or two in my mouth. Ok, now back to our main topic, the stuffing! Make sure you have everything at hand. It all goes in very quickly. So, start by chopping the onion, or even better put it in a blender and you’ll have it finely chopped in the blink of an eye. Pop the onion in a pan with warm olive oil to sweat and you can quarter your chestnuts whilst waiting. Add the meat with the onion and brown it well. Mix in the rice and put it off with white wine. It’s time for the pine nuts, chestnuts and raisins to get into the mix. Mix well, add 250 ml of warm water and let it boil. Take the pot off the heat, it’s time to add your spices and of course mix in.You will certainly have a lot of stuffing left over, add some more water and let it boil until it’s cooked through but moist. Not too bad for a simple roll, don’t you think?